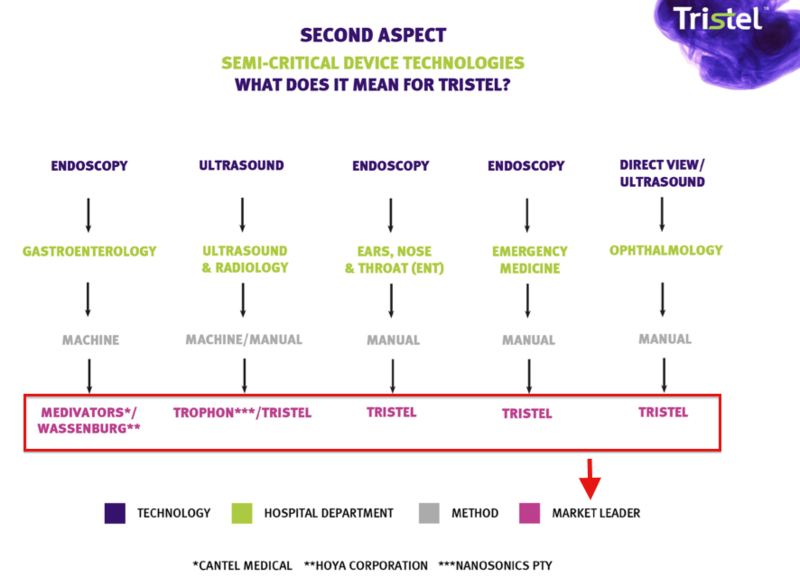 Long update on Tristel (TSTL). Summary: Similar to last year’s open day, this was a very useful shareholder event that accompanied a better-than-expected trading update. However, I thought the lack of any reference to UK revenue was odd and I await October’s full-year results for the finer details. For now at least, the disinfection specialist appears on course to meet its three-year targets and there are some promising developments with the planned venture into North America. Plenty of optimism, though, appears to be priced into the shares. I continue to hold. Last week I paid another visit to an obscure village in Cambridgeshire to attend TSTL’s second shareholder open day. 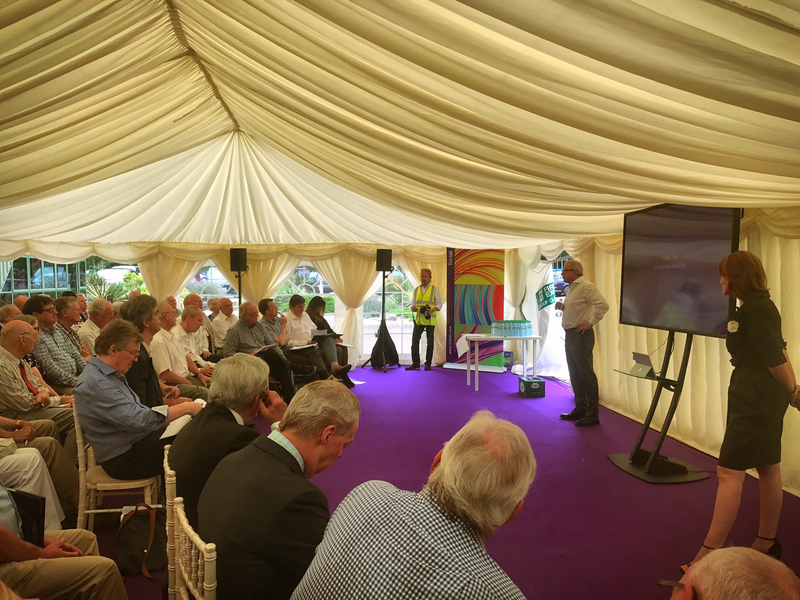 Similar to last year’s event, the open day consisted of a management presentation, a Q&A, a tour of the factory and ample light refreshments. Once again the main presentation took place in a white marquee out in the car park. Staff wore the same white carnations, and it was another sunny day, too. I have to commend TSTL for arranging these open days. They are popular with investors — I reckon at least 50 people attended this particular gig — and more quoted companies ought to consider hosting similar events. Bonus points for TSTL, too, for even including the script within its presentation material. The statement read very well, although the performance of TSTL’s UK division was never mentioned in the update — and it was not clear why. It seems to me UK revenue dropped a fraction during the second half and gained only 3% during the full year. 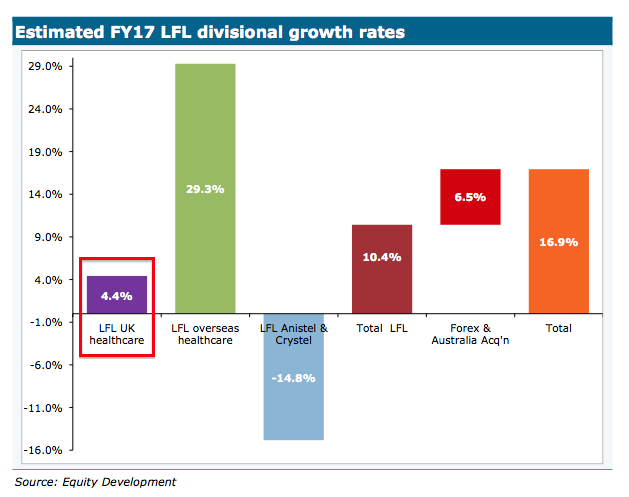 TSTL’s management was not very forthcoming on the UK performance, and informed me before the presentation that the UK business “was not in decline and continues to grow”. I thought it odd that no UK figures were forthcoming within the statement and presentation, given last year’s trading update happily revealed second-half UK revenue had gained 10% to £5.3m. 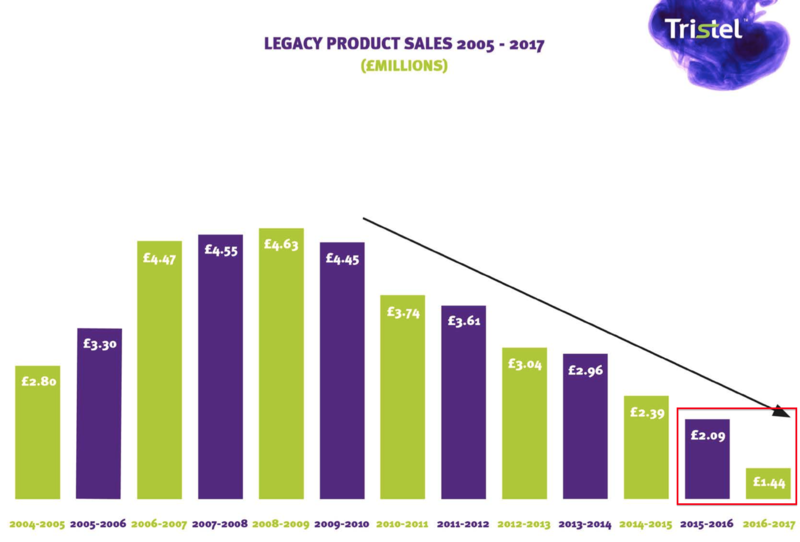 Perhaps the UK performance was affected by waning demand for TSTL’s ‘legacy’ products. This £650k shortfall is very likely to consist mostly of UK-based revenue. Again, this shortfall is likely to consist mostly of UK-based revenue. I can only presume the broker was assisted by TSTL with that 4% assumption. Back in October, TSTL projected its annual revenue could grow between 10% and 15% during 2017, 2018 and 2019, while its pre-tax margin could be kept at 17.5% or more. Last week’s trading statement confirmed 2017 revenue had improved by 17% while the pre-tax margin (before share-based payments) was 20% — or an impressive 22.5% if you exclude regulatory costs associated with the North American venture (see below). One member of the marquee audience asked whether the company’s guidance would have to be revised upwards following the 2017 progress. I must admit I cannot now recall management’s exact response, but I got the general impression the directors were very comfortable with their current projections. My sums suggest the company enjoyed a cash-generative year. The money spent on the Australian business, the Mobile ODT investment and the dividends — all of which was not expensed through the income statement — came to £4.3m. With the year-end cash balance reducing by £0.6m to £5.1m, it appears TSTL therefore generated cash of about £3.7m (that is, £4.3m less £0.6m) during the year from normal operations. That level of cash production underpins the pre-tax profit figure of “at least £4m” given within the trading statement. Unlike last year, this time there was no celebration of a special dividend within the car-park marquee. The lack of special-dividend news was due to the group assessing its expansion into North America. I was pleased this year’s open day provided a lot more information about TSTL’s venture into the United States. There was useful confirmation of the ongoing US regulatory costs, with £300k being spent in the second-half of 2017 and a further £300k to be spent during 2018. Both of those sums matched TSTL’s previous guidance. The group also cited Equity Development’s note that assumed £500k could be spent during 2018 to establish an American division ahead of the operation’s first sales. There was no change to TSTL’s December 2019 guidance for potential FDA approval of its disinfectants. Nor was there any change to the guidance of the first American revenue being earned by June 2019. The open day provided some clarity on two statements TSTL had issued earlier in the month. The first of the earlier statements concerned a regulatory submission to the EPA in the States, while the second involved a $750k investment in Mobile ODT, a developer of mobile colposcopes. However, exactly what an EPA-approved foam would be able to disinfect in the States was not made clear. iii) ‘non-invasive’ hospital equipment, such as x-ray machines and ultrasound workstations. The ultrasound workstation, in green, can be cleaned by a TSTL EPA-approved ‘intermediate’ disinfectant. However, because the actual probe, in blue, goes inside the patient, it has to be disinfected by an FDA-approved ‘high-level’ product — the best choice at present being a Trophon machine. Importantly, the Trophon machine can only disinfect the ultrasound probe — the associated cord and the workstation simply won’t fit into a Trophon. As such, the hospital has to ensure the entire ultrasound system is disinfected — which brings in TSTL’s manual disinfection products. But could manual products supplied by other companies be used to clean the ultrasound cord and workstation? TSTL did not think so. You see, given the ultrasound workstation is principally intended for women’s health, the disinfectant used should be effective against Human Papilloma Virus, which causes almost all cases of cervical cancer. TSTL’s chemistry can combat HPV, as can the Trophon machine. But according to TSTL, nothing else is effective. So the upshot of all of this is that an EPA-approved TSTL foam can co-exist with the Trophon machine — it should not be an either/or purchasing decision for the hospital. “EPA approval… is not the poor cousin to an FDA green light that we originally thought it might be”. EPA approval — and the follow-on US state approvals — ought to be all in the bag by December 2018. Anyway, the great hope is that once TSTL obtains FDA approval for the group’s Duo foam, then this product can then be used to disinfect the entire ultrasound system — workstation and probe — and the company could then take business away from the Trophon machines. Well, at least that is my theory. It’s not often you sit in a company presentation and the directors highlight rival businesses in their slides. Yet that was the case at this open day. TSTL lost the gastroenterology department to the machines some years ago, when the leading manufacturers developed or acquired their own disinfectants. However, I believe all is not lost within the ultrasound department. The aforementioned Trophon machine is the main rival here, and I learned from the open day that this machine cleans only ultrasound probes. TSTL claims market leadership in the ENT and ophthalmology departments, and — as you’d expect — in locations such as ambulances where machines simply can’t operate. One member of the marquee audience asked whether automated machine washers were a threat to TSTL’s leadership. TSTL’s management admitted automated machines were not prone to the same human errors that TSTL’s manual products could face. But the executives did argue that “machines can fail”, were expensive to purchase and maintain, and that TSTL’s products had been used for years by thousands of hospital employees and the manual process was viewed as “robust”. 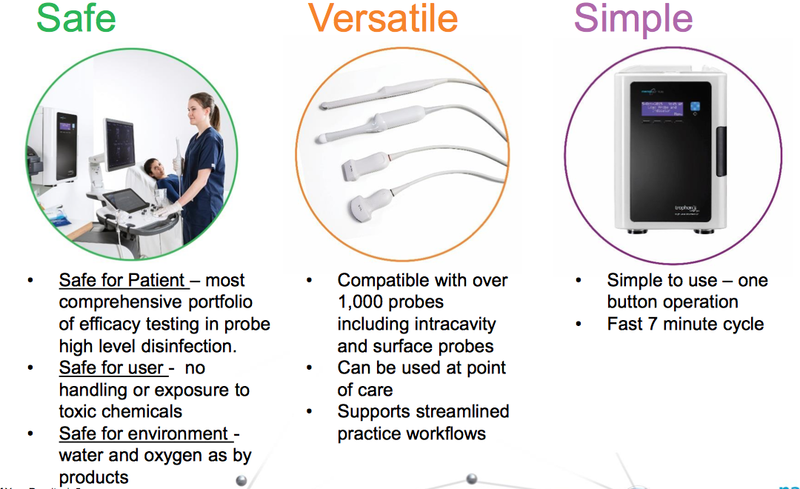 While the Trophon machine is prominent within ultrasound departments, I presume a new machine would have to be developed for other medical departments to handle their differing instrument sizes and types. Meanwhile, TSTL’s manual cleaning products can be applied to all instruments and in all locations — such as within ambulances — where machines can’t be used. Similar to last year’s event, this open day provided an opportunity to study a handful of new products. I have to confess that I was not bowled over by what I saw. I think the “product innovation” TSTL referred to was a screw-top lid that contained capsules of disinfectant chemicals. When the lid is screwed on to the container, the capsules are opened to release the chemicals into water and produce a disinfectant solution. It seemed to be a simpler version of the Puffin product from last year, which I note did not make it to the showcase display this year. I also discovered TSTL employs only two full-time product developers, which does not sound that many in a company of 100 people. 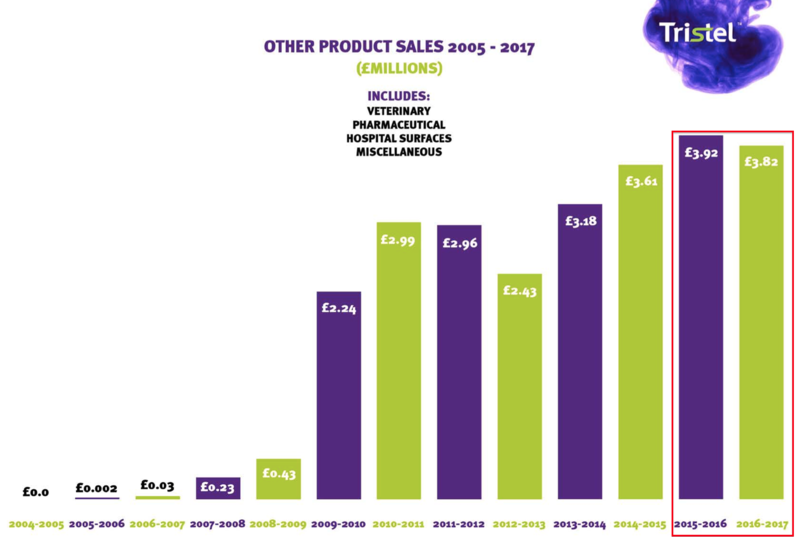 That said, the main Trio wipes and Duo foam disinfectants continue to sell well… and I’d like to think this business does not require ground-breaking new products to meet management’s ambitious growth targets. The open day provided the chance to take a guided tour of the factory. I experienced the same feeling as I did at last year’s open day — that the facilities aren’t actually all that imposing. There’s a warehouse area stocking a large number of chemical containers, and next to that are eight metal vats used to produce the disinfectants. Then down the corridor were two packaging areas, which did not seem that busy. What was particularly insightful from my different guides was that all of them said there was ample scope to increase capacity within the factory — without the need for extra space or infrastructure. Apparently, all that would be required would be extra people or shifts to cope with any additional volumes. Indeed, there was talk of the factory being more than ready if large orders from the States suddenly materialised. Other tour snippets included TSTL not being dependent on particular suppliers or manufacturers, with generally three or four options available should the group need to switch. One employee claimed TSTL was now “in the driving seat” when it came to negotiating the purchase of chemicals. I think it is fair to say TSTL’s 250p share price is expecting further revenue and profit growth for some years to come. A pre-tax profit of “at least £4m” for 2017 ought to translate into earnings of about 7.5p per share, which in turn would support a current P/E of more than 30. Adjusting for the £500k expensed on US regulatory costs and the £5.1m/12p per share cash position, you could argue underlying 2017 earnings could be 8.4p per share and the P/E is 28 based on an enterprise value of 238p per share (the 250p share price less the 12p cash position). Alternatively, assuming TSTL continues to outperform its three-year guidance — with annual revenue growing by 17% and a pre-tax/pre-US costs margin of 22.5% being sustained — I reckon earnings could reach 11.7p per share during 2019. That — perhaps somewhat ambitious — projection would reduce the P/E multiple down to about 20. The current rating also reflects the potential for great things from TSTL’s venture into North America. I must admit, the opportunity in the States does seem to be very promising — even though the regulatory hurdles are taking far longer to clear than TSTL had originally expected. I’m particularly hopeful about the tie-up with Mobile ODT, which plans to serve 10 million women within large parts of rural America. 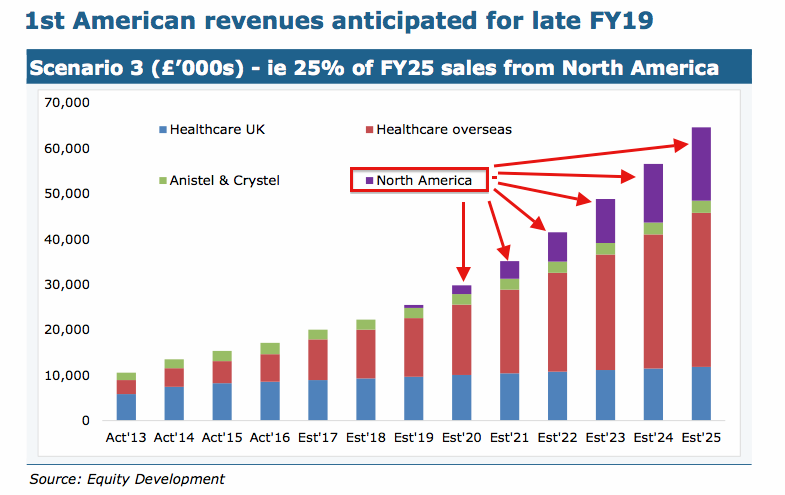 I have to say, US revenue of up to £16m is quite a prediction… given the first submission for US regulatory approval occurred less than a month ago. This entry was posted in My Shares, Tristel and tagged Tristel, TSTL on July 26, 2017 by Maynard Paton. Thank you Maynard for another excellent summary. A small point on the UK revenue : it’s worth noting that the 2017 H1 results included £150k of what were effectively forward purchases by the NHS. Adjusting for this means the UK revenue is pretty similar for the the two half year periods. Yes, good point. What I also should have mentioned was the trading statement ending by saying “We are pleased that overseas sales in the year represented almost half of the total and we anticipate that our overseas operations will continue to expand.” It would have been nice to have some reference about the UK in there as well. I guess all will be revealed within October’s results. Wow – thankyou so much for a very detailed, clear report. Thanks Maynard, analysis to your usually high standard. Nice photo too–I think a selfie might have gone down well with your followers. I am actually in the picture. Can you spot me? I have recommended this post and would urge other folks to spread the word. The Maynard Paton report has crystallised the importance of the limited US approval (EPA, short of full FDA approval) covered in the recent releases by the company. Also the importance of their investment in hxxp://www.mobileodt.com. I last topped up in February at 150p, although there will never be another chance like July last year when I bought at 90p. I guess most of the good news is no priced in now, and Oct. 19th is not far away. Tristel plc (AIM: TSTL), the manufacturer of infection prevention, contamination control and hygiene products, announces a change to the expected approval date from the United States Environmental Protection Agency (EPA) for its foam based chlorine dioxide product DUO. A meeting with the EPA in October 2016 and subsequent communications with the agency guided the scope and content of the Company’s Duo submission which was made on 30 June 2017. The EPA has now informed the Company that it has changed its approach and additional information has been requested. This additional data has largely been compiled and submitted. As a result, the EPA approval is now expected in May 2018, rather than late 2017 as originally anticipated. Approval will be followed by the state by state registration process and the Company’s revenue expectations are not affected by this slight delay. I am not too surprised by this development. Looking back at my notes from a 2015 webinar, they indicate TSTL was originally planning to have an FDA-approved product launched by June 2017. But… here we are in October 2017 and an EPA-approved product — which requires less regulatory hurdles to clear than an FDA-approved product — has been delayed for five months and is now set for May 2018. Oh well. At least it appears the delay is due to the EPA changing its approach and not TSTL submitting duff info. I doubt the five-month delay will matter that much if TSTL’s USA venture eventually comes good. The reassurance of first North American revenues being generated during the 2018/19 financial year does not mean that much to me. TSTL could earn $1 on 30 June 2019 and still claim it has met its target. Hi Maynard, Any thoughts on the latest Finals. They look solid enough to me and the US certification when it comes should see a bounce back to the high of a few weeks ago. A write-up should be on the site later this week.